The fact that an elder from the Cai Clan had gone missing didn’t cause a huge commotion. The Cai Clan didn’t even seem to have noticed, and also didn’t look into the matter very deeply. The Giant Ghost King didn’t do anything out of the ordinary either. In fact, to anyone who wasn’t aware of the events which had just played out, it would seem as if nothing at all had happened. However, it was very different among the people who were in the know. To them, it seemed like a storm of disaster was brewing! The people in Devil Penitentiary who had heard the Cai Clan elder’s confession were all very nervous, and didn’t dare to discuss the matter. They merely waited to see what would happen next. “It's been a whole month,” Bai Xiaochun thought. “Why hasn’t the fighting started yet?” He had been paying very close attention to the situation, and yet, even after an entire month, neither the three great clans nor the Giant Ghost King had made a move. “But they haven’t made a move. And the Giant Ghost King hasn’t said a peep. Could it be that they’re still feeling each other out?” He scratched his head in befuddlement, and couldn’t help but feel a bit of disdain for the Giant Ghost King. “There can’t be many demigods this lame. If I were a demigod, I would just go wipe out all three of the great clans. That would take care of the problem. “And as for the three great clans, either they’re not fully prepared, or they’re hesitating. Well, regardless of which it is, this is a good opportunity for me!” With that, he checked his bag of holding to see how many souls he had left from when he had robbed the Cai Clan’s soulgrounds. After performing fourteenfold spirit enhancements on all of his magical items, he had been left with a bit less than half the original amount. Later, he had done some experimentation with fifteen-colored flame, which left him running very low. “Out already. Conjuring flame really is a big waste of souls.” He narrowed his eyes in thought for a moment, then nodded his head. “I have to take some risks sometimes. I’ll just go check the situation out. If the chance presents itself, I’ll take some souls. If not, then I won’t worry about it.” Feeling both nervous and excited, he thought a bit more, then rose to his feet. Devil Penitentiary was on lockdown, but Bai Xiaochun was now the number one dark inquisitor, and was also the one who had dug up the critical intelligence to begin with. Clearly, he was not on the side of the three great clans, and therefore, Li Xu approved his request to leave the prison. Before long, Bai Xiaochun was in disguise, and heading through the moat toward the city. The moat wasn’t very large, but nevertheless, Bai Xiaochun found a place where he could leave it without attracting attention. Soon, he was outside of Giant Ghost City. “It's too bad I have to be very careful about revealing my ability to disguise my appearance. It really leaves me no choice other than to use ordinary disguises.” He was currently wearing a wide-brimmed hat, and some extra layers of clothing to make him look bigger. Keeping his head down, he headed away from Giant Ghost City, and in the direction of the Chen Clan. “I already robbed the Cai Clan, so they’ll definitely be on guard. The Bai Clan has too few souls to make it worth my time. The Chen Clan is the only option....” Eyes flashing, he flew quickly to the location where the Chen Clan stood. Arrayed in different locations around the clan were eight soulgrounds. The mere sight of the vast number of vengeful souls flying around the floating, beehive-like structures in the soulgrounds caused Bai Xiaochun to swallow in anticipation. Unfortunately, the soulgrounds were all very close to the clan itself, and also very tightly guarded. Despite the speed he was capable of, he was fairly sure that as soon as he did the deed, he would be discovered. “The Chen Clan is really too stingy. They're just some measly soulgrounds, right? What's the point in guarding them so heavily! ?” The feeling that came from being able to look at something and not touch it really left him disgruntled. “They’re just some souls, right? I can't believe these super rich clans are so stingy! What bullies!” Sighing, he decided that the opportunity he had been hoping for had not been presented. Depressed, he headed back to Giant Ghost City. Just when he was about to enter the city and head toward Devil Penitentiary, his eyes widened as he saw a figure speed out of the giant ghost statue and head in his general direction. Despite the great distance involved, considering the level of his cultivation base, Bai Xiaochun was easily able to determine that he was looking at Duke Deathcrier. Furthermore, he appeared to be heading in the direction of the Bai Clan. Considering that Duke Deathcrier was a deva, and that he wasn’t attempting to conceal his actions, it meant that Bai Xiaochun wasn’t the only one who could see him. Quite a few people noticed, and many of them began to ponder the significance of what they were seeing. Although Bai Xiaochun was surprised, he didn’t put too much thought into it, and continued on his way. It was getting dark, but the streets in the city were still crowded. At a certain point when he was only about halfway to the moat, a brilliant light suddenly began to shine from the giant ghost statue. As the light shone out from the royal palace on the head of the statue, a person appeared. He was tall and strong, and wore a violet robe with a serpentine dragon embroidered on it. He had a royal crown on his head, and emanated a heaven-shaking, earth-shattering energy. Even as he hovered there, he exuded pressure that could stifle everything in heaven and earth. Then he began to stride through the air above the city, almost as if he were going on patrol. Quite a racket could be heard as countless soul cultivators dropped to their knees to kowtow. As for the city guards on patrol, they reacted in a similar manner. The Giant Ghost King looked completely calm as he strode silently through the air. Thunder rumbled, and the clouds churned. It was even possible to see lightning dancing about. All of these heavenly portents struck fear into the heart of the people below. Even more shocking was the enormous shadowy figure which walked along behind the Giant Ghost King, a figure which seemed so powerful that if it fully formed, it could rip heaven and earth to shreds! Bai Xiaochun’s aura was in chaos; this was his first time seeing the Giant Ghost King, and the shocking energy that the man emanated left him deeply shaken. “Did the Giant Ghost King leave his palace to try to threaten the three great clans?” Bai Xiaochun swallowed hard as he observed the terrifying figure up above. As he did, he heard a voice that he hadn’t heard for a long time! It was the little turtle who had been missing for so long. No matter how Bai Xiaochun had ransacked his bag of holding, he had never been able to find him, not even in the hiding place he’d discovered the time he had rendered the little turtle unconscious. On many occasions, Bai Xiaochun had even come to the conclusion that the sharp-tongued little turtle must have left. Although that thought had left him somewhat relieved, he was also disappointed at the loss of the turtle. Who would have ever imagined that the turtle would suddenly show up at this time? Jaw dropping, he looked down at the turtle, whose eyes were gleaming as surely as if he had spotted a valuable treasure. In fact, Bai Xiaochun was fairly certain that he was actually drooling. “Y-you’re... you’re still here?!? !” Bai Xiaochun was actually delighted. He had long since come to feel very alone out in the Wildlands, so to have the little turtle with him was a great thing. To hear such stinging words immediately took Bai Xiaochun’s delight at meeting an old friend and transformed it into anger. “Shut up!” he said. 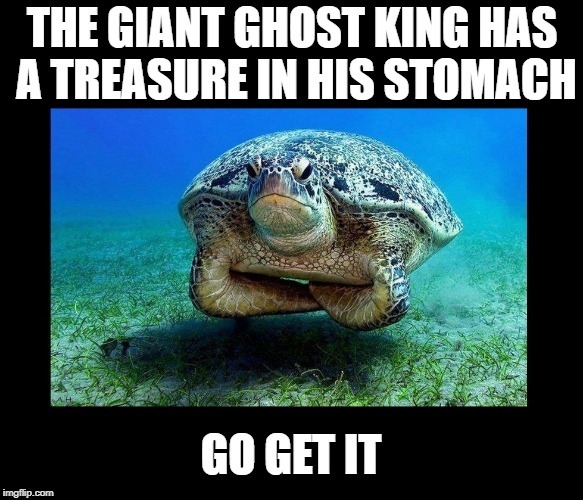 Ignoring the little turtle, he looked back up at the Giant Ghost King for a bit. Then he shoved the little turtle's head back into his bag of holding and flew back into the moat, and beyond it, Devil Penitentiary. Around that time, the Bai Clan deva patriarch was in a grand hall in the Bai Clan, looking grim-faced at Duke Deathcrier! Duke Deathcrier sighed inwardly. Because he was a close follower of the Giant Ghost King, he was privy to a few secrets that no one else knew. Furthermore, he was able to speculate at what the king was thinking. However, he still couldn't figure out why he had been asked to go to all three of the great clans and directly ask the patriarchs if they were planning a rebellion. In fact, the Giant Ghost King had even hinted that he should offer concessions to the three great clans to keep the peace. Duke Deathcrier was very nervous about the whole thing. The truth was that the patriarch was taking advantage of this situation to see if the Giant Ghost King really was as clueless as he was acting. After all, the three great clans weren’t quite ready to make their move!